Another storage news flood has been washing over us. In between the waves we caught our breath and penned this catch-up. Private equity-owned Arcserve has bought cloud disaster recovery/backup-as-a-service supplier Zetta. Transaction terms were not disclosed. Zetta was founded in 2008 by Jeff Treuhaft (ex-CTO who went to Fusion-io), CTO Jeff Whitehead, and ex-chief scientist Lou Montulli. At acquisition the CEO was Mike Grossman but he no longer has that role. Zetta has taken in $45.9m in six rounds of funding. Unless this was a distress purchase then Arcserve paid more than $50m. The acquisition extends Arcserve's coverage further from that provided by its recent email archiving purchase. Arcserve's flagship Unified Data Protection (UDP) hybrid on-premises/public cloud system suite will now include Arcserve UDP Cloud Direct, a new direct-to-cloud DRaaS and BaaS offerings based on Zetta tech. Arcserve says it now has a disaster avoidance offering and IT teams can implement on premises, hybrid cloud and direct-to-cloud from a single pane of glass. Jeff Whitehead, the former Zetta CTO, becomes Arcserve's CTO. The company says it will soon deliver a comprehensive and affordable near-zero data loss recovery point objective (RPO) offering with near-instant recovery time objective (RTO) priced affordably for mid-size and decentralised enterprise organisations. CEO Mike Crest said: "Over the coming months, we'll change the game with an affordable, completely seamless solution that will limit customers' data loss to nearly zero and will support all mid-market platforms, hypervisors, cloud and on-premises, ultimately making DRaaS solutions that lose hours of data a relic of the past." Arcserve UDP Cloud Direct, will be available through its North American partner network this summer, with broader availability and local data centres in EMEA this autumn, and Japan within the year. The availability of the current Arcserve UDP hybrid cloud service is unaffected. Current Zetta customers will continue to be fully supported. Contrary to HyTrust's statement a week ago, it appears it did not buy DataGravity, only some assets – and DataGravity common stock is worthless. The statement claimed: "HyTrust, Inc, a leading workload security provider, today announced the acquisition of DataGravity, a data visibility and security company, to further automate and enhance security policy enforcement for workload data." DataGravity is under the control of Barry Kallander, head of KallanderGroup, a consultancy that sells advisory services to distressed businesses and those in "special situations". When the only remaining option is an asset sale and exit, KallanderGroup can provide end-to-end services to manage and negotiate a sale, address governance issues, and administer an orderly winding up of the Company that provides the best value to creditors and stockholders. Kallander said it specialises in "early and emerging stage venture and private equity backed portfolio companies where the prospect for an 'up exit' is questionable and investors are reluctant to deploy additional capital." The Register has seen communications that stated HyTrust did not actually buy the DataGravity corporation but only certain assets, that DataGravity's common stock is worthless and its holders will get nothing. A section 228 notice, under Delaware General Corporation Law, is a communication to stockholders about a decision made by a majority of the stockholders. We understand HyTrust bought the main software product, DataGravity for Virtualisation, took over some or all of its offices, and hired some of its people, such as VP Marketing Fred Kost, CTO David Siles, and others. We asked HyTrust and KallanderGroup for comment. Siles said: "I have never left as an employee of DataGravity until the acquisition was complete when I joined HyTrust. All assets minus the hardware business were acquired by HyTrust. "The hardware line of business was left behind and those assets that remain are being managed by the Kallander group. "We won't comment on any other rumours as the facts are wrong. We are private companies and have no requirement to disclose purchase arrangements." Datos IO has joined Cisco's Solution Partner Program and there is now a joint data protection offering. The Datos IO RecoverX software runs on Cisco's Application Centric Infrastructure (ACI), UCS servers, and its HyperFlex hyperconverged systems, and offers hybrid cloud and multi-cloud environment support. Tarun Thakur, Datos IO CEO, had a canned quote: "We're extremely excited to partner with Cisco ACI, Cisco UCS and Cisco HyperFlex teams... leveraging the cloud for operational data protection use cases, such as backup and recovery, compliance, test/dev, and cloud mobility." Deduping backup to disk vendor ExaGrid announced record bookings and revenue for Q2 2017. It grew double digits over the same quarter of the prior year. The company said it was continuing its trend of progressive growth at a faster rate than that of the overall market and market share gain. It has posted a record number of new customer six-figure deals in the current quarter. Bill Andrews, Exagrid's CEO and President, quoted off a hymn sheet he is getting used to using: "We are seeing the larger enterprise customers looking for better performance at a lower cost than the first generation of backup storage solutions can provide... ExaGrid delivers real savings while also improving backup and restore performance over deduplication in the backup application and over first generation inline scale-up deduplication appliances. We are seeing an increased need for longer term retention of backups and for VMs and data to be accessible in seconds to minutes after a disruptive event." His company is only growing its market share because one or more other deduping to disk backup suppliers are not. Andrews added: "Over 80 per cent of ExaGrid's newly acquired customers are replacing first generation deduplication approaches from Dell EMC Data Domain, HP StoreOnce, Commvault Deduplication, and the Veritas 5200/5300 series of appliances. These solutions can be cost prohibitive for backup storage and are also slow for backups, restores, and VM boots." Hammer it home, Bill. In-memory data grid (IMDG) supplier Hazelcast says Apache Gora is the latest Apache project to use Hazelcast IMDG. Gora is an open-source framework which provides an in-memory data model and persistence for big data. Alongside Gora, Hazelcast IMDG has also been deployed in four other Apache projects: Camel, TomEE, Shiro and Karaf. It reminds us that Apache, developed and maintained by Apache Software Foundation, is the most widely used web server software. Hazelcast has become a member of Eclipse MicroProfile, a baseline platform definition that optimizes Enterprise Java for a microservices architecture and delivers application portability across multiple MicroProfile runtimes. Russ Fellows of the Evaluator Group thinks Optane SSDs have real performance advantages and has written blog about it. The results showed significant performance enhancements, but more importantly significantly better price/performance. 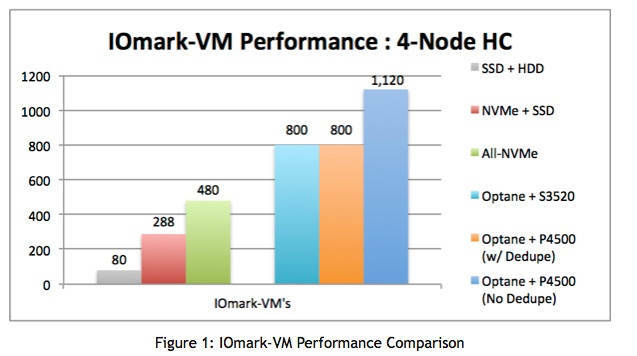 Fellows says the hyperconverged system achieved world-record performance and price-performance results with the Test Report available here and the IOmark certification results here. His point is that the Wikibon view on Optane not being of practical use is wrong and the test results validate his thinking. Startup OwnBackup has gained $7.5m in B-round funding. It's developing a Software-as-a-Service (SaaS) application backup and restore offering and has automated, daily backups of SaaS and PaaS data, and data compare and restore tools for disaster recovery. The round was led by Insight Venture Partners, a New York-based private equity and venture capital firm, and existing investors Innovation Endeavors, Orzyn Capital and Salesforce Ventures piled in too. The company is headquartered in Fort Lee, New Jersey, and has an R&D and Support Center in Tel Aviv, Israel. It claims to be the vendor of choice for some of the world's largest users of SaaS applications and says it had 330 per cent year-over-year revenue growth in 2016. CEO Sam Gutmann talks about a vision that no company operating in the cloud should ever lose data. He said the cash will be used to grow the team, scale the business, deliver transformative stuff and raise awareness. Gartner says worldwide semiconductor revenue could total $401.4bn in 2017, an increase of 16.8 per cent from 2016. The market reached the $300bn milestone seven years ago and surpassed $200bn in 2000. Its growth rate has been steadily accelerating. Andrew Norwood, research VP at Gartner, said: "A shortage of memory is creating a boom in the overall semiconductor market. Memory vendors have been able to increase their price for DRAM and NAND, driving revenue and margins higher. "As the largest memory supplier, Samsung Electronics is set to gain the most. This gives Samsung its best shot at capturing the No. 1 position from Intel for the first time." But: "What the memory market gives, the memory market takes away. The memory bubble is expected to go bust in 2019 as memory vendors add new supply and Samsung could lose a lot of the gains it makes this year and next." Data warehousing and analytics company Teradata has bought StackIQ, which has open-source bare metal software provisioning software and has managed the deployment of cloud and analytics software at millions of servers in data centres around the globe. Teradata will now own StackIQ's IP that automates and accelerates software deployment across large clusters of servers (both physical and virtual/in the cloud). It will leverage StackIQ's expertise to simplify and automate the deployment of Teradata Everywhere analytics software. StackIQ's engineers will join Teradata's R&D organisation. Oliver Ratzesberger, EVP and chief product officer for Teradata, said: "Adding StackIQ technology to IntelliFlex, IntelliBase and IntelliCloud will strengthen our capabilities and enable Teradata to redefine how systems are deployed and managed globally." The terms of the acquisition agreement were not disclosed. Shire Plc bought Baxalta, a global biopharmaceutical company based in Bannockburn, Illinois, in January 2016. Baxalta had been spun off from Baxter International in July 2015, and needed to set up a new IT system as a result. Its previous infrastructure consisted of a mix of storage products, including IBM, EMC and NetApp systems. Finding these had been lengthy to deploy, needing more than a month to get the off the ground, it chose Tintri storage instead, running with Cisco UCS servers and VMware. This set-up was deployed in under a week. Shire was previously a believer in hyperconverged systems. But Baxalta convinced Shire to standardise on Tintri storage and Cisco servers instead. We're told Shire was able to buy all of Tintri and Cisco infrastructure it needed for both its US and Europe data centres for the same budget it had set aside for just buying additional hyperconverged systems for the European expansion project. Mike Baker, Baxalta's data centre architect, said: "With hyperconverged, we had to scale compute and storage together, even when we only needed more of one resource and not the other – resulting in excess cost. "Since Tintri and Cisco UCS can be scaled independently, we no longer have to buy everything up front we can grow incrementally as needed and deploy our new Tintri and Cisco UCS architecture in small and medium-sized pods. When we need more compute, we just put in more UCS blades. If we need more storage, we can add more Tintri VMstore systems." Box has appointed Stephanie Crullo, who has CV history at Apple and Cisco, as its COO. Incumbent Dan Levin stepped down after seven years at Box. Per Stritich is Box's VP for its Germany, Austria and Switzerland (DACH) region. Excelero has appointed Kirill Shoikhet as chief architect. He comes from Dell EMC where he sent seven years at XtremIO, became a Distinguished Engineer, and headed up the team developing the next generation of XtremIO's architecture. He will work with Excelero's technical and product leadership to define future product strategy and design a comprehensive and complete set of next-gen NVMe storage services to meet the needs of the company's customers. ProphetStor has appointed Guillaume Imberti as EVP and GM for EMEA. Thomas Barrett and Guy Berlo have been appointed as VPs for North EMEA and Central EMEA respectively. The company has opened its EMEA HQ in Versailles, France, and it will manage localised sales and marketing in subsidiaries in the UK and Germany. Prior to joining ProphetStor, Guillaume served as VP and GM of EMEA at Cirrus Data Solutions, and, before that, was president and GM of FalconStor Software EMEA, with a stint as managing director at Seagate Software (acquired by Veritas Software) Southern European Operations before that. Tachyum has signed up Fred Weber for its Board of Advisors to help steer Tachyum's efforts to conquer the performance plateau in nanometer-class chips and the systems they power. He was at AMD for 10 years becoming its CTO. We're trying our best here, OK?